Jackie made this fantastic figure using the Mexican Paste recipe to add to a piano cake made by her friend. Karen made this fantastic cake. The bottom tier is a traditional fruit cake, the second a lemon sponge, the third a carrot cake with lime butter cream and the top a vanilla sponge with raspberry curd and white chocolate butter-cream. It sounds delicious. All photos on this page are the copyright of their respective owners, and are displayed with the owner’s permission. @Sue. The 9″ chocolate cake under Sponge Celebration Cakes is sturdy enough for covering in fondant and I have used this recipe many times. You could use white chocolate instead of brown for a different flavour. However, if you are looking for a more dense Madeira texture, let me know and I will post one. I’ve just completed your fruit cake for my sisters 25thwedding anniversary in 2 weeks. 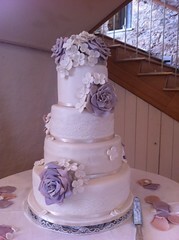 However it’s a 2 tier and the second tier is sponge cake. Do you have a good recipie for a 9 inch square sponge cake please ? It will be covered in fondant so need it sturdy. @Jackie. If you need vanilla sugar quickly, most large supermarkets sell tubs of vanilla sugar ready to use. However, if you do not want it for a week, making your own is very simple. You will need a vanilla pod as essence will introduce moisture and make the sugar go hard, caster sugar and a screw top jar (a clean jam jar is ideal). Put enough caster sugar in the jar to cover the bottom, place the vanilla pod in the jar and then fill to three quarters with caster sugar. Give the jar a shake every couple of days and after a week you will have delicious vanilla flavoured sugar. Just keep topping up the jar when you have used some of the sugar. One vanilla pod lasts months.